﻿﻿﻿﻿Catching a wild horse was a childhood fantasy of mine. When I was a small child my father bought a wild colt from my Uncle P, caught in the Sawtooth Mountains of Idaho. As a boy I had images of racing through large mountain meadows, a herd of horses ahead, browns, blacks, pintos, and of course the beautiful appaloosa, all there for the taking. In my dreams I always closed in fast. My rope would circle the head perfectly of the lead stallion; he always had wild eyes as he would twist and stare back at me, his captor. Then I would throw on the binders setting my horse back on his haunches stopping the stallion in his tracks. He was always coal black and had perfect lines. Fantasies are great that way. You can ride the fastest horse, throw the perfect lasso, be the real deal, be the Marlboro man. Hmmm… that sounds really wrong. What was just a fantasy for me was a reality for several of my uncles, including Uncle H. The blond mane of the golden palomino waved in glory as it bounced and waved in the wind along the outstretched neck of the tall stallion. Ginger was a truly fast horse and his gallop would eat up real-estate faster than a land tycoon. A group of wild horses were ahead and Ginger had been given his rein. With Uncle H on his back the two were soon leading the charge. Two brothers now eating dust urged their horses on, doing their best to keep up. Across the rough terrain they went dodging lodge pole pines. Uncle H was moving in close and began working a loop into his rope. The loop hung low as he streaked toward his prey and in an unfortunate moment the rope snagged a piece of brush. Immediately the rope began peeling out taking with it pieces of flesh caught between the saddle horn and Uncle H’s fingers. Blood dripped freely down and across the saddle horn. The rope now whipped about slapping Ginger across his rear flank, startling him. Fully spooked with ears bent back, and nostrils flared, Ginger took off in a panic. Uncle H hung on and realized quickly, reining Ginger in was impossible. The hot sun shined bright, highlighting the drama. Bright yellow desert flowers streaked by in a blur, while Ginger held a full throttle. Madly they raced down the mountain. Ginger was wild with fright trying to escape the long snake nipping at his back side. Uncle H knew his only hope was to hang on, as all efforts to rein in Ginger went for not. Down the mountain they flew in a storm of dust, with the wild horses leading the way. They were gaining fast on the brood and it wasn’t long before the two slid past the wild bunch smoother than butter. Desert brush tore at Ginger and whipped at Uncle H’s legs, tearing skin and britches. A field of loose shale could be seen ahead. Uncle H left a prayer in the dust, in hopes that Ginger could keep his footing. They hit that field at full tilt and sure as anything the footing was lost. Ginger reacted by collapsing his rear legs. The ground look closer to Uncle H then he wanted with the sharp shale now up close. Down they slid. The shale sliced a long gash in Ginger’s belly. The field came to an end and the prayer must have been answered because Ginger was once again up and off at a full sprint. His neck stretch long as his legs pounded the ground. The invisible demons had not given up the chase and the terrorized horse skidded around the edge of a ravine making his escape. He followed an old trail along a rock overhang. Turning hard he launched down the mountain like a locomotive. Together they ran jumping small ravines, fallen logs, and boulders. In a flurry of dust they came down the mountain. After some time they finally hit level ground. Ginger began to ease up, near exhaustion. His wet withered sides carried a layer of foam and his great chest expanded taking in large volumes of air. He had finally run himself out and Uncle H was allowed to rein him in. They eased to a stop both spent from the race. 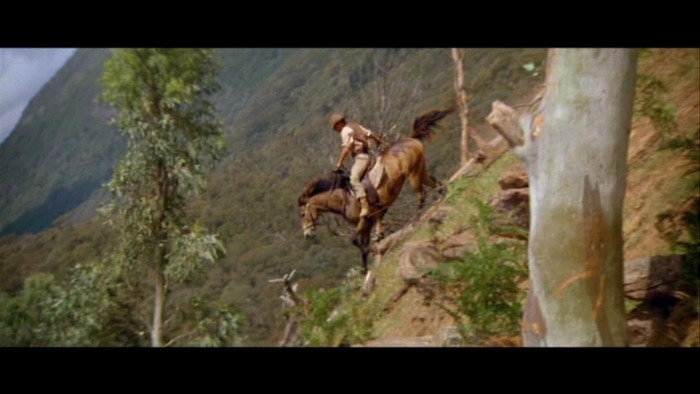 As Uncle H dismounted to check Ginger’s condition he was never happier to get off a horse. The wild horses escaped capture that day and Uncle H had the arduous task of back tracking the miles they had just covered, coaxing along a still frightened, tired, and wounded horse. Not all of Uncle H’s trips ended in futility. He tells of another time when he had lassoed a wild colt and again Ginger was in a running mood. It is a sad tale. Few details were given, only that Ginger about drug that poor colt to death before Uncle H could rein him in. In the end the colt healed up and Uncle H had a nice colt. Totally loved that story GQ. You had me breathing hard--now stop that. There is a wonderful book there between Uncle H's adventures and your prose. Please do it. "his gallop would eat up real-estate faster than a land tycoon." Loved that among others. You should write a book on Uncle H. This read like a western cowboy movie!! Every lil boy and dreams of having an uncle like H. You are the really lucky! I think Uncle H would make a terrific subject for a book, too! I've really enjoyed your posts about him. Having been a horse lover all my life and having owned a few, trained one from a colt, I really do relate and appreciate your stories and Uncle H! Hope you have a great day -- in spite of the gray, grumpy skies! Arkansas Patti: Thank you – That is very kind. Silverine: You are way too nice. I agree with you that Uncle H is a great Uncle and person. Dianne: I will get by and search through the achieves to hear that interview. So, how did that flirting work out for you? Sylvia: Today inspite of the gray skies it was good. My daughter came by and daughter, niece and the main lady did some holiday baking. I was sent to the garage to clean out the freezer. How does a freezer get cluttered? It seems like a physical impossibility. Oh…I forgot humans are involved. It’s all been cleanquilled. Lynda: What an honor, thanks for stopping by. I hope your year is going good and your new batch of kidlets are keeping you busy. Thanks for staying tuned! Michele: You’re the best! And you made my day! Thanks! What wonderful surprise. Wow what an awesome narration. I think I can hear the pounding hooves right now! What great story telling! Once again, I'm reminded of my Dad and his adventures growing up on a farm. One of them was the time he thought he'd practice becoming a trick rider with one of their horses. Too funny, .. and painful! Is uncle H. still with us? I don't recall you saying. What an interesting man! Uncle H or not; I'd know the man from Snowy River anywhere! Wow reminds me of Gregory Peck an d Clint Eastwood! Anita: The nicest thing said to me all day…Thank you! Pat: Uncle H is still with us – he’s health as a horse and checks in to read the comments – so keep saying nice things. I want to hear that story of the non-trick rider. My imagination has three scenarios already lined up. MA Fat Woman: Shhhh… don’t tell Choco. BTW – thanks for stopping by! Choco: Of course it is Uncle H – why wouldn’t it be? Today is a double good day. First I find out you agreed with me at M.A.M.B.A.N.G., now I get a compliment. This is defiantly a banner day. Thank you! Amrita: Now that’s a compliment – thanks! Great story, GQ. I love horses but a ride like that would probably do me in. Looking forward to reading more. Amazing!!! What a wonderful picture to go with your story. This Ozark Chick has witnessed Her dad 'breakin' horses but never have I been on a wild horse adventure...now, wild~eyed cattle is another story! Loved the post, man. If I knew about how hard it is, I'd pick another fantasy sooner. It looks so easy and grand in the movies. Wow, what a story and so well told! Am over from Hilarys to offer congrats on POTW mention... but I'll be back to read more. What a great read. Had to get a shot in my knee after being discarded by one we were breaking a few weeks ago.Hated to hear the nurse ask why I didn't let a younger person do it. Your tale had me on the end of my seat! I've been in the Sawtooths -- beautiful country. Beautifully told story. I'm breathless. Thank you. Looking forward to more tales of Uncle H.